After a 3-hour bus ride and 11.5-hour flight, we arrived back in the Americas. The US skyscrapers welcomed us from the air, and the delicious Starbucks coffee was our first familiar beverage back on North-American soil (drinking a good tea or coffee was sometimes challenging in SE-Asia & China but ordering a good one on spec – half sweet, no fat, no foam – now that’s America for you!). 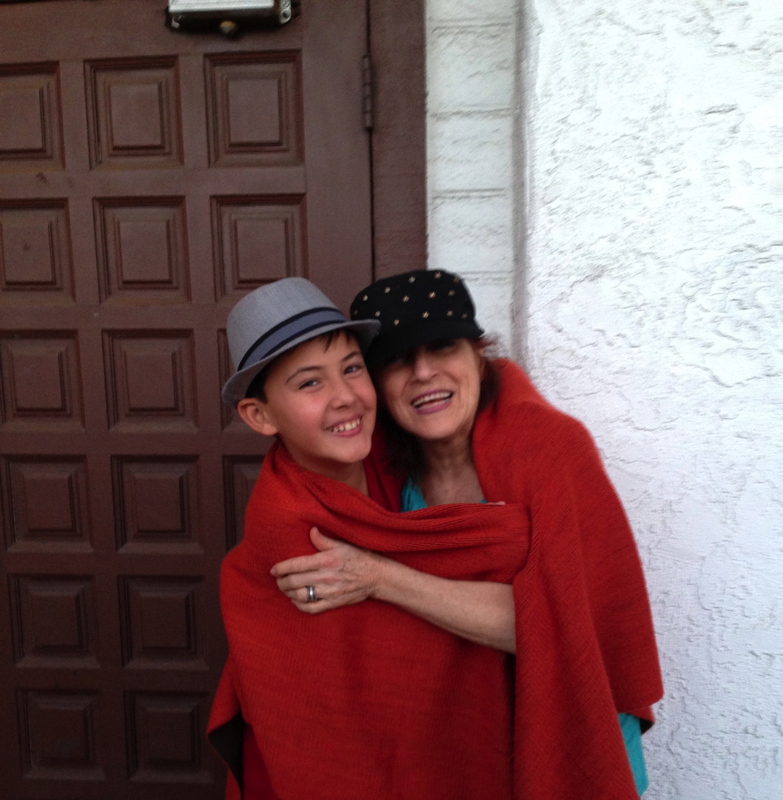 It was with mixed feelings that we returned to the USA… Leaving the beauty and exotic allure of Asia after 6 months was an adjustment, but the wonderful reunion with grandma YiaYia and uncle James (Nuno) was making us all really excited to be there. Our first couple of days in The States, we did what we haven’t really done in 8 months, but what America is great for: we consumed! We hit the mall and did some damage at the fantastic outdoor adventure store, REI (www.rei.com) – where the kids got outfitted with some bright coloured, foldable down jackets, some real hiking boots & pants (to be ready for the colder weather and elevations in South America), a traveling pouch and a set of cool hats. 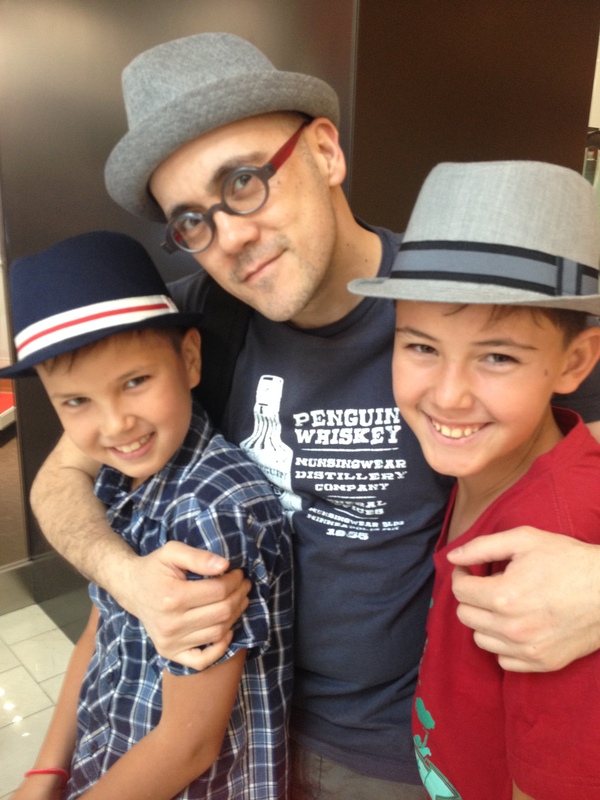 Thanks to the wonderful generosity of YiaYia and Nuno! 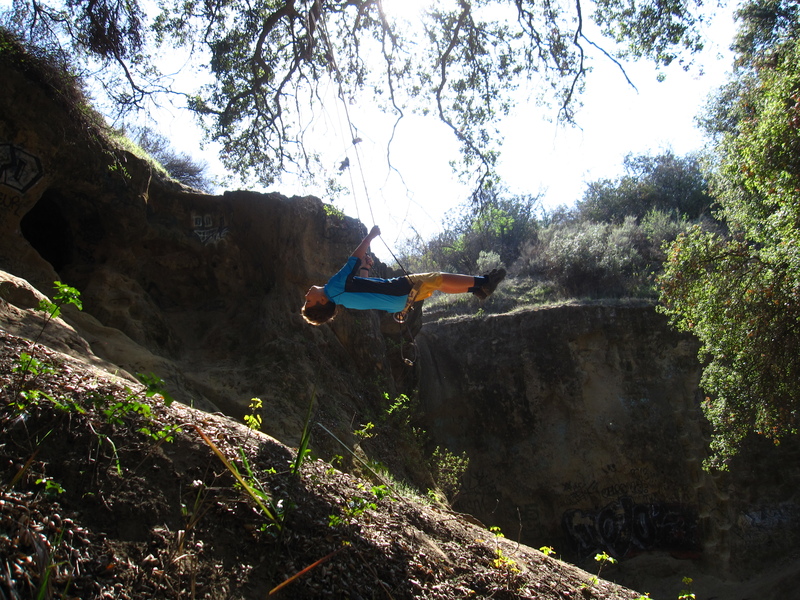 To test out the new walking shoes, we hit the Santa Monica Mountains for a hike to the VanAlden Cave. 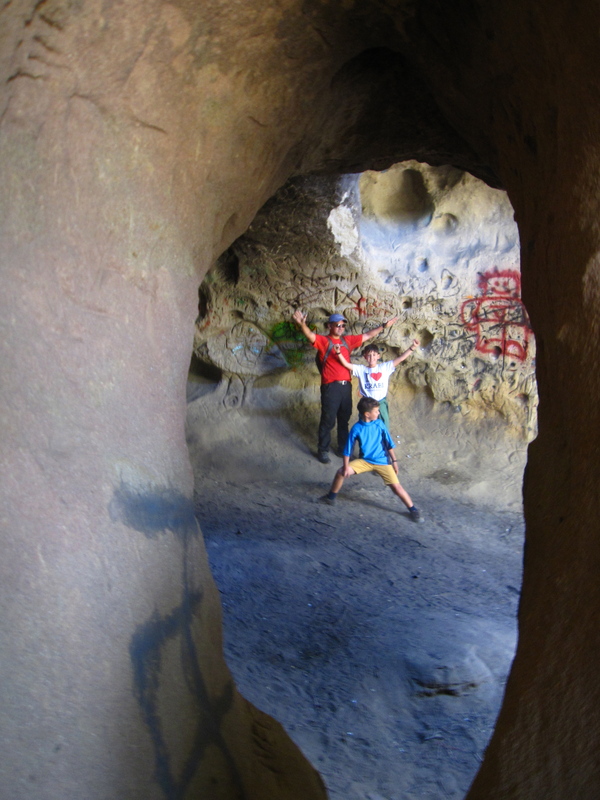 This cave (near Tarzana) is a sandstone den about 25 feet tall, 25 feet wide and 50 feet deep. The roof of the cave is only a few feet thick with a many holes that like skylights, illuminate the cave walls, which are covered with funky carvings and graffiti. 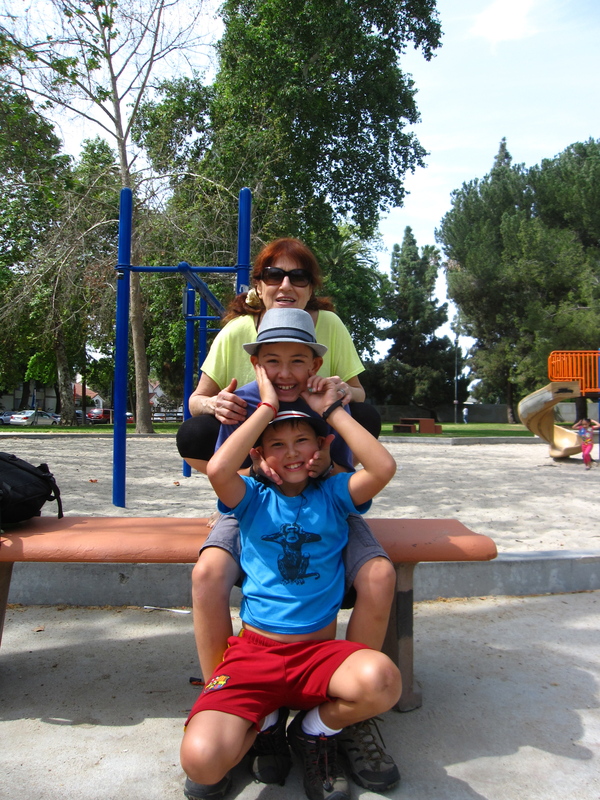 Of course, the children had a blast exploring, sliding, climbing and swinging. 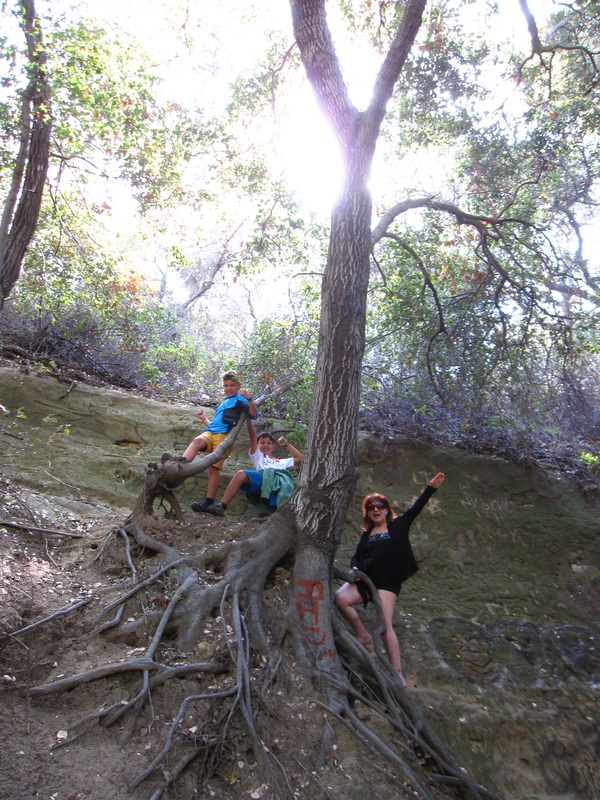 And we were amazed, seeing our crazy YiaYia (CAB), still climbing trees! 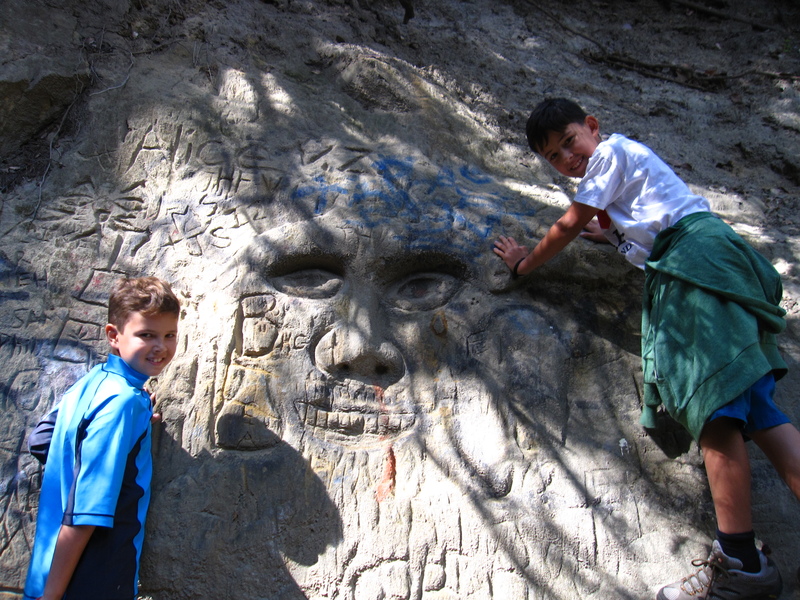 Strange and humorous faces carved into the rock, at the VanAlden Trail, Santa Monica Mountains. It was a wonderful afternoon in nature and the trail provided a great panoramic view of the city and the Santa Monica Mountains. Following a delicious picnic lunch, we headed back down the steep and slippery trail to our monster of a rental car. The bigger the better in the USA! The children have always enjoyed their afternoons of bowling with YiaYia, so it was time to pick up the tradition and head to the bowling alley for some fun, competitive games. In teams of three, we had great laughs and offered one another lots of encouragement (which was needed as they only had the very large and extremely heavy balls to play with). After some hugs from a local senior citizen, who was delighted to see so much family fun, and some fast games of air hockey, we were ready for some dinner. 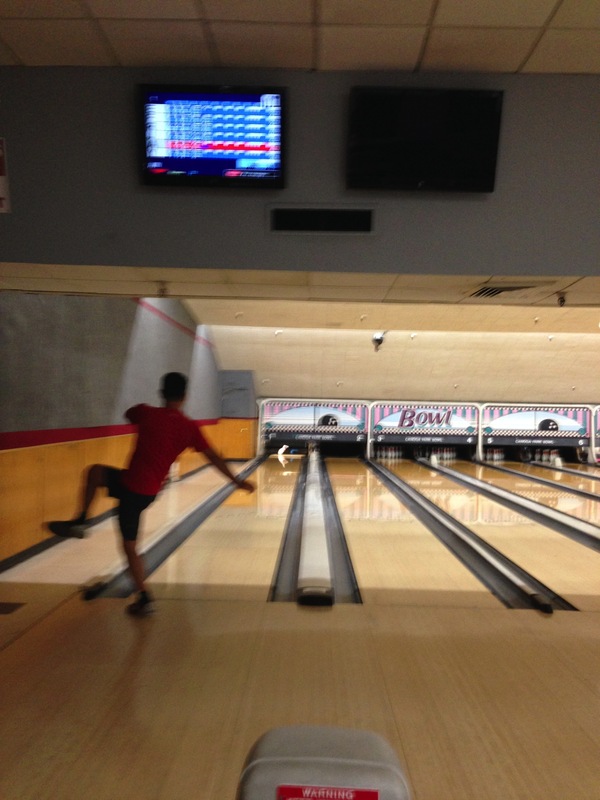 Is Anthony bowling or dancing? Who knows, but his technique seemed to work as he had the highest score. It was Nuno’s desire to enjoy some good Mexican food. I was under the impression that it was states such as Texas that were known for their great Mexican food, due to border proximity, however every corner in Los Angeles also seemed to have a Mexican food outlet to choose from. After review of a few, we landed on Las Hadas Mexican Restaurant & Entertainment (http://www.lashadasrestaurant.com/Home.html). What a great choice we made! Not only was the food delicious and copious (the waiter was amazing and offered us all kinds of complimentary dishes), the restaurant also had a Karaoke Bar attached (a somewhat shady place with some interesting characters line dancing in cowboy boots …felt like a scene from the 80’s but was great fun nevertheless)! Following a very satisfying meal, we headed next door to sing some tunes. 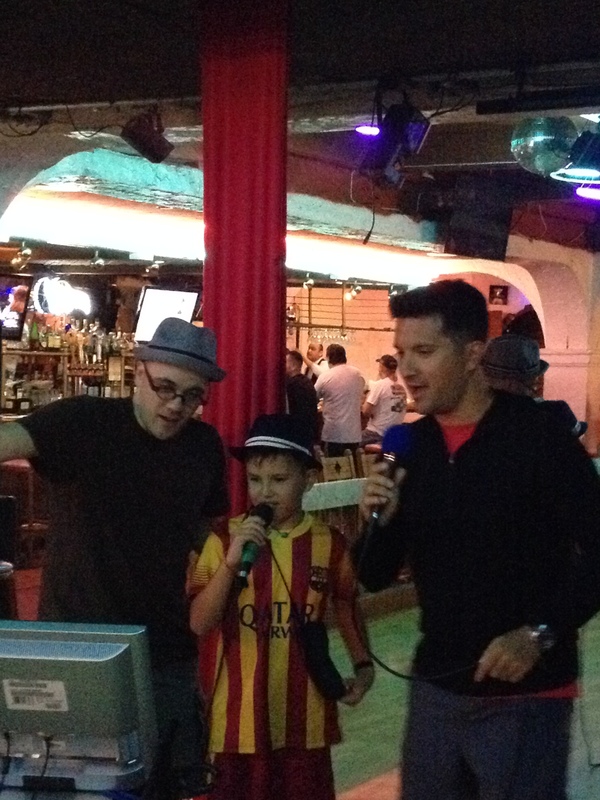 Anthony, Nuno and Filou made a great ensemble, singing the Canadian song “If I had a million dollars”. Emile was not too thrilled to be on stage, but when YiaYia and Nuno needed a little assistance getting their song going, he jumped onto the scene and offered some help. YiaYia was delighted with his thoughtfulness and showered him with sweet words and hugs. Karaoke singing, so much fun! But there were more food requests! Emile was not going to leave the US without eating a good BIG burger. 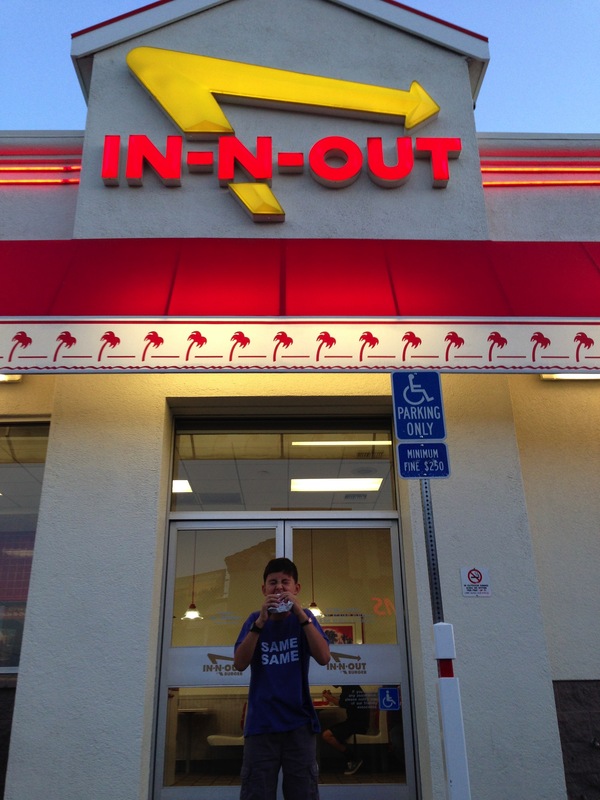 Already on the airplane, he was salivating and when overheard by a fellow passenger, he learned that In ‘n Out Burger (http://www.in-n-out.com), was the place to go to in LA. He downed one very large, juicy meat patty and went back for more the next day…. And of course, the week would not be complete with seeing a movie on the big screen (in this case, the newly released Muppets movie), with a MASSIVE bucket of popcorn and a supersize pop. 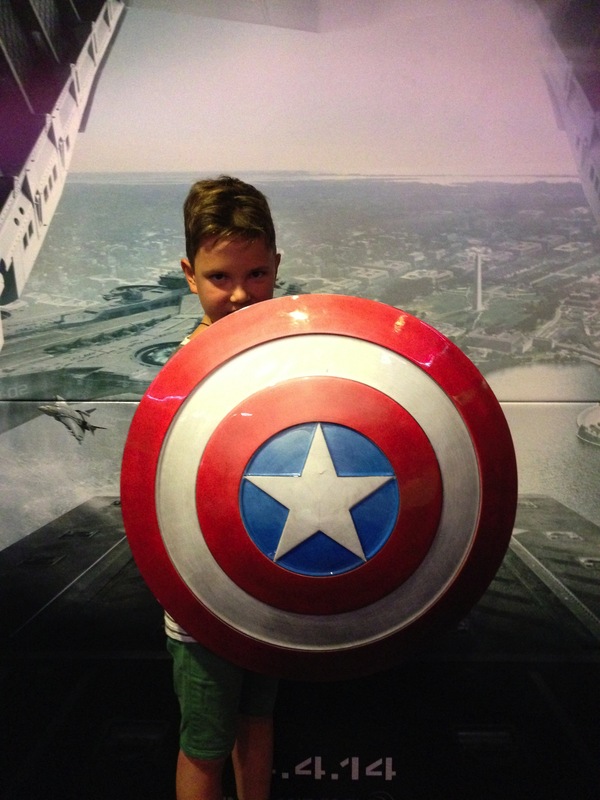 The popcorn was so big, the children skipped dinner that night – which says a lot for our “eating machines”! Our week in the US was the antithesis of our last 8 months of travel, however we understand now why people like California so much; the weather is just perfect (sunny but not too hot, no humidity), the service level is top (everyone is just so friendly and helpful) and prices are so reasonable. It was a great place to connect with family for a week. Thank you YiaYia and Nuno for coming to join us. We love you lots and the boys are missing you already!